Amazon Brand Solimo Multipurpose Drawstring Trash Bags, 50 count only $5.72 shipped! This is a fantastic price for these Amazon Brand Solimo Multipurpose Drawstring Trash Bags! Amazon has these Amazon Brand Solimo Multipurpose Drawstring Trash Bags, 50 count for only $5.72 shipped when you clip the 20% off e-coupon and checkout through Subscribe & Save! This is a great stock up price on trash bags! Psst! 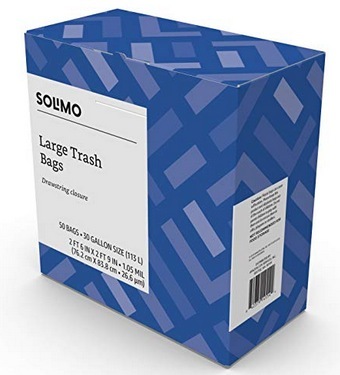 Don’t forget you can also still get great deals on Amazon Brand Solimo Storage Bags as well! « Compartment Travel Organizer only $9.49 shipped!